UPDATE: Just sold two more hoops- I didn't even try, a neighbor approached me and said "I want to have a JenniHoop", then another neighbor just heard me talking about selling that one and instantly wanted to buy one. Great!! Here are a few finished JenniHoops!!! Ok, I'm not actually sure that's what I want to call them but I've started making adult hula hoops! I've made a few child sized ones for Gray and another girl in the neighborhood, but the draw is really that these are for adults to play with. 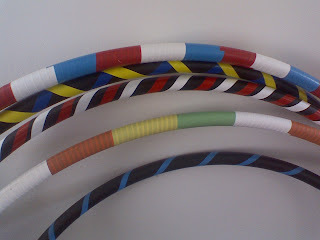 This idea is not new or especially original, apparently tons of people across the country make their own hula hoops. Of course I've only learned about that since I started making them two days ago, but still, they're amazingly fun. I got my supplies the first day and sat down to make one. My neighbor, Jay, was having a bad day. Within five minutes of hooping (he needed to be coerced into it initially) he was happy. In fact, he spent the next hour or so decorating one. Then a short while later, my other neighbor Kim had a friend over. I was having so much fun, the enthusiasm hooping is contagious! Of course I had to rope Kim's friend into trying one. She loudly declared that she was a physical anomoly, unable to hula hoop at all. She got inside one and immediately had success! She hooped on her first try! Within 30 seconds she declared she had tears in her eyes and asked me how much (they're $20)- I sold her one which she has vowed to keep in her bedroom so her children can't steal it. HA! That was so much fun! So, here I am, loving every second of making these. I love the joy on people's faces when they hoop for the first time since their childhood. Because these hoops are large and somewhat heavy, they are very easy to use. The spinning is rhythmic and cathartic and a great workout. I'll be posting a lot about my hoop adventures in the coming weeks. I have plans to make better designs, different sizes, and of course plenty of hooping videos, me and others. Cool. They look great. That's exactly how the Vandedrome got its name, too. I think OOPs is pretty appropriate. Sums you up, no?